My kids aren't babies anymore and now they're older when they get money for birthdays or holidays like Christmas they get to keep it. Living with a mom who sews and sells her things online and at shows they appreciate the hard work, quality, and love that gets put into every item. I try to take them to my shows especially the local ones. Once they hear they're coming to a show those piggy banks are shaking. Here's some photos of my children and there most favorite handmade buys! In this photo Noah (10 yrs. old) is at his desk in his room with his dog and cheetah. The dog was bought back in 2007 at Bazaar Bizarre by an artist called Skunk of Skunkadelia. I remember with all the chaos going on at that show he was enthralled with Skunks designs made from bicycle chains. Since we have cats and no dogs he felt that it was the perfect choice for him. He moves around the room from the end table to the dresser back to his desk. I think it helps with homework. 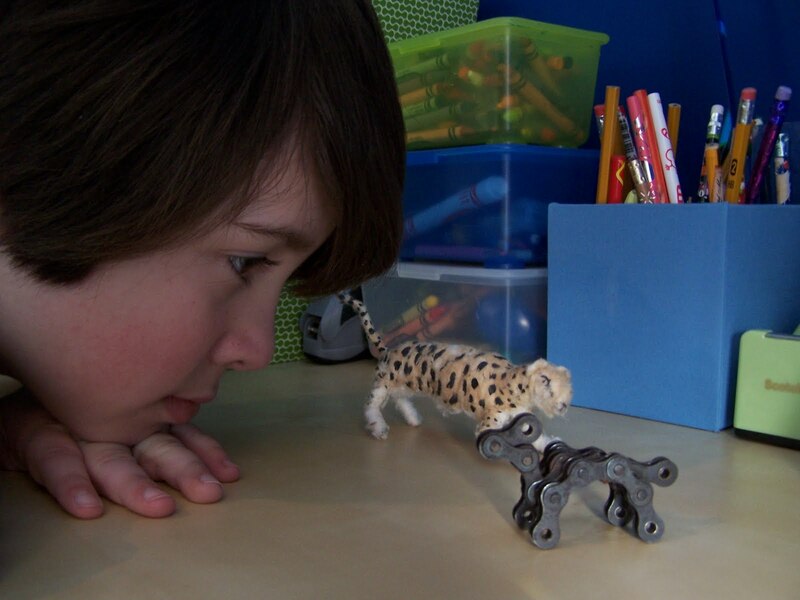 The cheetah was bought in 2008 at Boston Handmade's first Somerville show. I was manning my booth while my husband Justin took the kids around to shop. I think Noah stopped at Crystal of Vintage By Crystal booth and was hooked. I don't blame him! The cheetah now hangs out on his headboard and at playtime attacks clone troopers. Abigail who will be turning 9 in May is posing with her bunny and artwork of a girl and her bird. The bunny was bought at the 2007 Bazaar Bizarre from Marilyn Patrizio of So Softies. 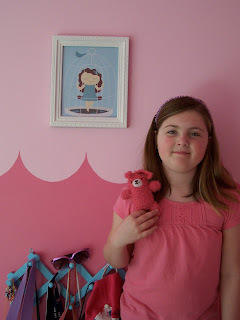 As you can see she loves pink especially pink crocheted amigurumi bunnies. She hangs out on the lap of another bunny on her dresser then other times cuddled for bedtime. The artwork was purchased online at Calobee shop on Etsy. When we added a second level to our house to make room for our kids, Abby wanted a pink room with birds. When looking for artwork we came across a designer close to home. We fell in love with her whimsical and playful designs. Abby thought the little girl in the photo looked like her and found the girl swinging in the birdcage funny.